There is a wonderful story about how a cow, a legendary dairy cow named Noble’s Golden Marguerite, came to be interred on the campus of North Dakota Agricultural College, now North Dakota State University. Is there, in fact, a cow buried on campus? Marguerite was the prize producer in the herd of Samuel F. Crabbe, a dairyman who lived near Fargo. By the early 1920s he had built up a herd comprising one hundred purebred cows. The dairy program was big at the college in those days, partly because Professor and later President John H. Shepperd was so enthusiastic about animal husbandry. He was a cheerleader for the accomplishments of Noble’s Golden Marguerite, who was born in 1914 and in 1921 produced, as confirmed by Babcock tests, 977.7 pounds of butterfat, setting a new state record. Marguerite died at age 18 on August 12, 1932. According to the accepted story, at the behest of President Shepperd, she was buried in front of the Dairy Building and her grave marked with a monument. The monument is a boulder of granite fitted with a plaque of bronze. 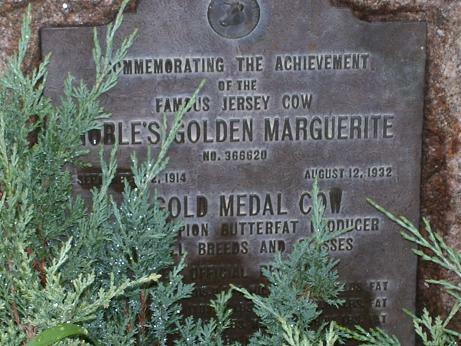 The plaque describes Marguerite as a “Gold Medal Cow” and a “State Champion Butterfat Producer.” Sometime late in the 1970s the monument to Marguerite was removed from her presumed gravesite in front of the old dairy building and placed in front of Shepperd Livestock Arena, which was considered a better match. "Noble’s Golden Marguerite," Bimonthly Bulletin of the North Dakota Agricultural Experimental Station 12 (May-June 1950): 160-61. Danbom, David B. "The North Dakota Agricultural Experiment Station and the Struggle to Create a Dairy State," Agricultural History 63 (1989): 174-75. Want to talk about this monument, or other heritage sites on the northern plains? Join the discussion on Facebook. Check out the center's Facebook group, Heritage Trails.